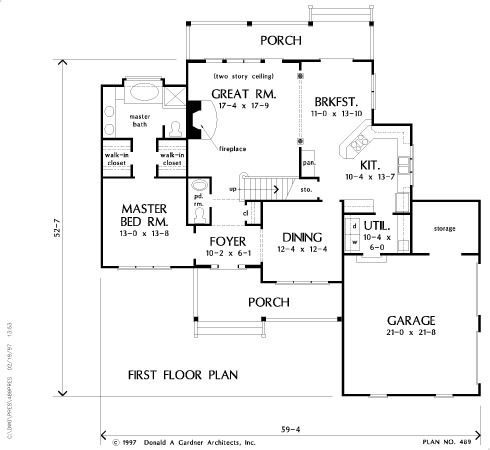 A smart exterior and an economical use of interior space combine to create this roomy, yet practical home. The two-story foyer leads to a two-story great room with fireplace, a wall of windows, and access to the back porch. Columns divide the great room from breakfast room, which is open to an angled kitchen with pantry. A handy utility room leads to a two-car garage with ample storage space. 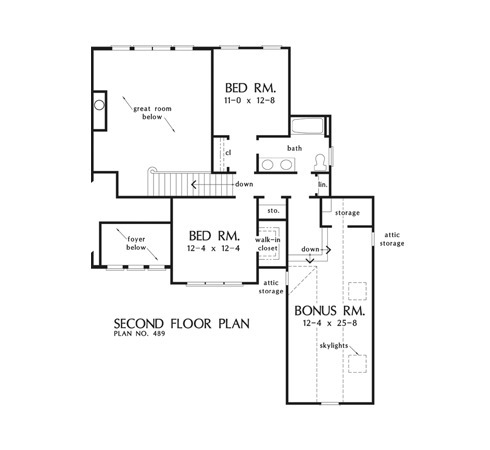 A split bedroom plan places the master suite, with two walk-in closets, on the first floor and two additional bedrooms, a full bath, and skylit bonus room on the second floor. 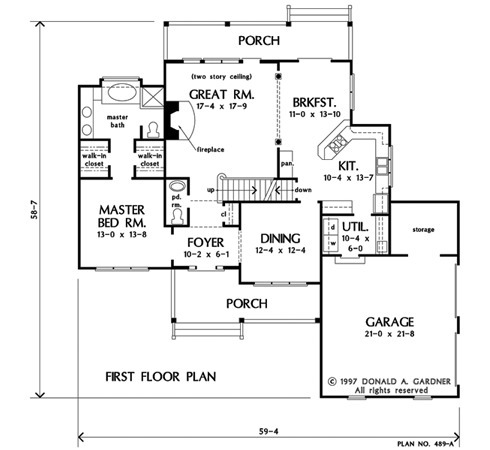 House Dimensions: 59' 4" x 58' 7"
Foyer (2 Story): 10' 2" x 6' 1" x 18' 1"
Great Room (2 Story): 17' 4" x 17' 9" x 18' 1"
Kitchen : 10' 4" x 13' 7" x 9' 0"
Breakfast Room : 11' 0" x 13' 10" x 9' 0"
Bonus Room (Vaulted): 12' 4" x 25' 8" x 9' 4"
Garage Storage : 10' 4" x 8' 0" x 0' 0"
Master Bedroom : 13' 0" x 13' 8" x 9' 0"
Porch - Front : 10' 6" x 8' 4" x 0' 0"
Storage (Bonus) : 7' 4" x 4' 0" x 9' 4"
Storage (2nd Fl.) : 4' 0" x 3' 0" x 0' 0"